Professor Brian MacCraith, President of DCU, welcomed participants on to the 2015 CEEN Educators module; Ireland's first programme dedicated to embedding entrepreneurship within the HEI curriculum. 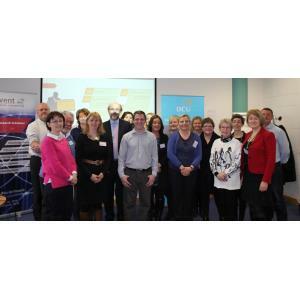 A total of 16 participants joined the CEEN Level 9 Educators Module, which commenced on Friday 6th February 2015 at DCU. The module aims to support educators embed entrepreneurship teaching and learning within their teaching and througout their institution. The module was piloted in 2013/14 under ACE (Accelerated Campus Entrepreneurship) and funded by the HEA. Since the pilot, ACE was reformed as CEEN (Campus Entreprepreneurship Enterprise Network) and the module has since been approved as a linked module for the LIN Post Graduate Diploma for Academic Professional Development (http://www.lin.ie). To find out more about the programme, contact Dr Emer Ní Bhrádaigh (emer.nibhradaigh@dcu.ie) or Peter Tiernan (peter.d.tiernan@dcu.ie).